Scanning speed: 12 pages per min. Fujitsu's one touch overhead scanner gives your business multi-purpose versatility with digital efficiency. Scan any type of document whether flat sheet or bound up to A3 in size. 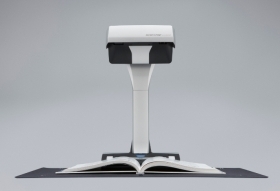 The SV600 automatically corrects curved page distortion in bound documents up to 30mm deep and contactless scanning helps protect delicate documents and produces high-quality readability using VI technology. The world's most versatile scanner. The ScanSnap SV600 lets you concentrate on your core business, helping to save space and manage all types of documents with one touch ease. Now you only need one desktop scanner for all your documents whether bound reports, magazines and newspaper cuttings. Contactless scanning is ideal for delicate manuscripts, images or other valuable items up to A3 in size. The SV600 is a unique overhead scanner. Its linear-type sensor technology with front-to-back scanning ensures the whole image is in focus for high quality scanned results even at the edge. Digitise anything with ease and efficiency. Multi-cropping capability allows you to scan and crop numerous documents in one scan and save them in the same file. ‘Page turning detection' and ‘timed scanning' features allow users to scan continuously without stopping to make allowances for different document formats. A competitive angle on scanning. VI technology integrates the performance of flatbed scanners, camera-type overhead scanners and smart devices into a single compact scanner to achieve unique operability and high image quality - combined. The moving overhead unit keeps everything in sharp focus using a deep depth-of-field lens which provides a wide auto focus area and CCD linear image sensor. The High directivity LED lamp achieves a consistent brightness without interference from surrounding surfaces. In short the SV600 comfortably minimises unevenness in image quality and generates a smooth image even when scanning from a distance. When scanning bound reports and books the all-in-one system scans, corrects, and digitises as you turn the pages and it also automatically recognises orientation. Digitised reports can then be read by flipping the pages – just as you would read a hardcopy report, manual or book - thanks to a feature of the bundled Rack2-Filer Smart software. Fast and simple; simple and fast. Organising and using digitised documents has never been more efficient, more flexible and more helpful. Once the ‘Quick Menu' is set up it can automatically display a wide range of ‘scan to' destinations whether computer-based or Cloud based applications. Document management could hardly be simpler for the small business. Fast start up time and scanning speed in a small footprint. Taking just three seconds to fire-up and be scan-ready and just another three seconds for scanning A3 size documents, it takes no time at all to digitise large 600 dpi images in colour. The SV600 is incredibly robust with a solid footing and is compact enough to enable efficient usage of your workspace without imposing on your daily routines when not in use. The bundled Nuance software allows users to read directly from cloud based applications and to save directly to those cloud based applications meaning that the possibility of using and sharing digital documents is extended. In case documents are intended to be managed locally, ScanSnap Organizer will provide an ideal repository. This application plays an increasingly important role in the ScanSnap eco system, especially when additionally utilising the recently introduced ScanSnap Sync functionality, which allows for cross linkage from the ScanSnap Connect App to for example Dropbox, to Nuance Power PDF or to ScanSnap Organizer. The contactless scanner that puts you in closer contact with your business. Whether enterprise level or entry level size business - see how every business can operate more efficiently with the SV600 overhead contactless scanner.